Which Miraculous carácter are you? Take this Love Quiz with questions in Spanish to meet the guy who hits you anymore. It is a test of easy questions, which deal mostly your tastes, which have to give the most honest answer. Answers all the questions and know the type of guy who most resembles your personality. You can repeat the test as often want to know if he is right, because the questions can vary the attempt. As you say, you must be sincere or not you will have good the guy that can combine with you, the answers remain between the machine and you. Discover and what kind of guy suits you best and go outside to look, love may be closer than you think. 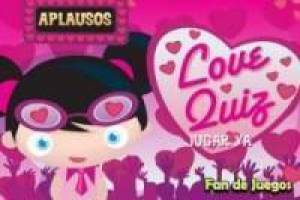 Enjoy the game Love quiz, it's free, it's one of our Love test games we've selected.